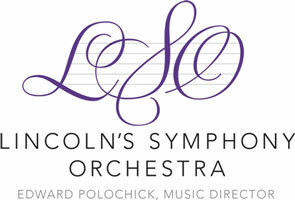 Lincoln's Symphony Orchestra tailors each of its concerts to meet the specific needs of your community. A wide variety of musical programs are available, including classical, popular, cultural, and educational. A 90- to 120-minute late afternoon or evening performance is available. The full symphony orchestra (up to 75 musicians) is best suited for larger auditoriums or for outdoor concerts. A 35- to 45-musician chamber orchestra is best for programs and locations requiring a rich, full sound in a medium-size hall or auditorium. Small instrumental ensembles, including string quartets or woodwind trios or quartets, are perfect for intimate gatherings, smaller locations, and educational programs. For all ensemble types: stage lighting; music stands and chairs; conductor's podium; possibly a tuned grand piano, harpsichord and/or 3 timpani, 3 dressing rooms. Maximum negotiable fee: $21,540 for full orchestra, $7,500 to $12,500 for Chamber/Educational ensemble. Availability: Travel and performance time within a single day is limited to 9 hours.